There is a legendary book for tennis racquet collectors covering everything in tennis racquet development until the 90s. It’s called The Book of Tennis Rackets and is written by Siegfried Kuebler. The Book of Tennis Rackets is really the work of a diligent and knowledgeable collector and it also comes with two addendums to cover additional years as well as topics such as fake racquets and more. This is simply a must-have for the racquet collector. 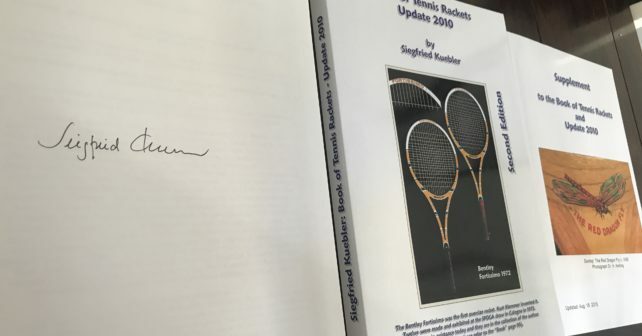 My copy of The Book of Tennis Rackets is signed by the author Siegfried Kuebler himself and since I’m not a collector of racquets I thought I’d give someone who really is the chance to buy this excellent book in brand new condition. The book is not available for sale anymore so this is a good chance to get an idea of tennis racquet history and get your knowledge of tennis racquets a boost. Let me know if you’re interested and we can discuss price. Here is more information about Siegfried Kuebler – the man who invented the widebody tennis racquet. I am interested. Is it truly in new condition, as you indicate?